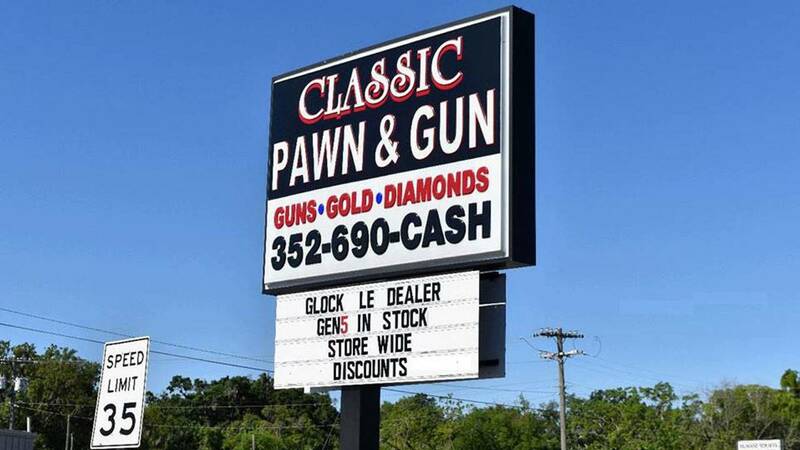 A sign advertising gun sales at the Classic Pawn and Gun shop in Ocala, Fla.
Ocala police said three burglars stole $9,000 in guns from a pawn shop Tuesday morning in under five minutes. 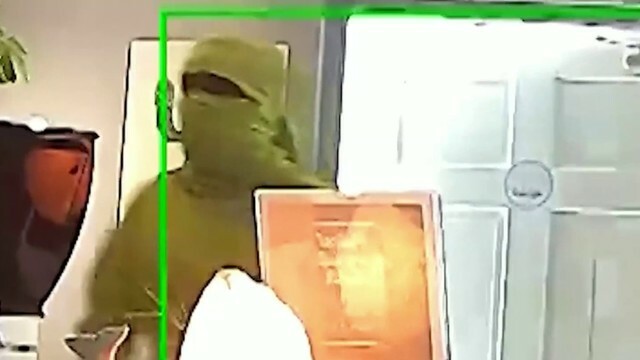 Surveillance video from inside the Classic Pawn and Gun shop at 33 Northwest 10th Street in Ocala showed three people with their faces covered with hooded sweatshirts break the glass front door and crawl through the bottom of the door into the store. The three burglars entered the store at 2:52 a.m. and were gone by 2:56 a.m., according to the surveillance video. Police said they believe the people entered the property through a neighboring business on Magnolia Avenue. The fence around Classic Pawn and Gun was down for ongoing construction, according to the police report. 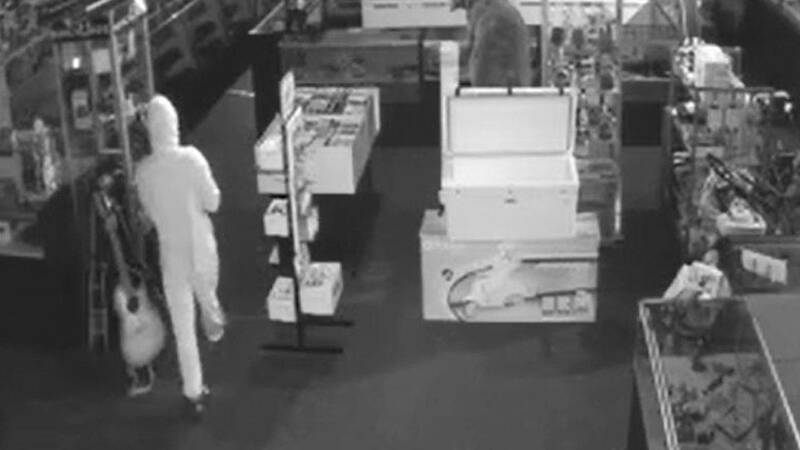 A still from surveillance video at Classic Pawn and Gun in Ocala where 15 guns were stolen on April 16, 2018. A sign outside the store advertised the business as a Glock LE dealer and "store wide discounts." 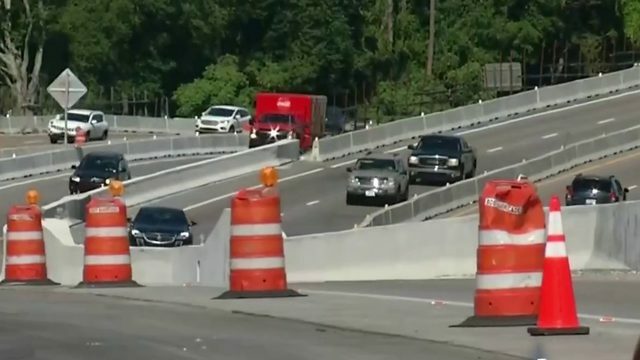 Officials said the three burglars stole a Glock 19 Gen 4, a Glock 34 Gen 4, a Glock 19 Gen 4, a Glock 42 380 Titanium Cerakote, a Glock 42 380 ACP, a Glock 19 Full Conceal Frame, a Glock 26 Gen 4, a Remington 760 rifle, two Taurus Rifle Circuit Judges, two Remington 700 SPS rifles, one American Tactical rifle ATI-15, one Century Arms rifle and one Atlantic Firearms rifle. Police said the weapons are valued at $9,000 and damage to the store property will cost more than $1,000 to repair. The store owner's son arrived at 9 a.m. to find that their family business had been the target of a burglary. More than 82,000 guns have been reported stolen in Florida in the last 10 years, and that number is likely below the actual number of stolen guns, because in Florida, owners aren’t required to report gun thefts, according to a 2017 investigation by the Tampa Bay Times and Reveal from The Center for Investigative Reporting. In 2016, at least one gun was reported stolen every hour, Reveal reported. One in five guns stolen on average is ever recovered. Cars and gun stores make easy targets, according to that investigation. Guns stolen from businesses during burglaries like the one in Ocala on Monday have quadrupled in the last five years, Reveal reported. An investigation by the Bureau of Alcohol, Tobacco, Firearms and Explosives, the Florida Department of Law Enforcement, Orlando Police Department and the Orange County Sheriff's Office led to the arrest of four men in March who authorities say stole more than 150 guns to resell on the streets. Only 30 of those guns have been recovered, some as far away as Tampa and New York. One weapon was used in the homicide of a 17-year-old at the Orlando Lux Nightclub in early 2017. News 6 asked ATF officials if there are any security requirements for businesses that sell guns. An ATF spokeswoman said the Gun Control Act of 1968 does not require a business with a Federal Firearms Licenses to have security. However, ATF does provide licensed gun sellers with voluntary security measures that they can take to prevent theft of their firearms. ATF special agents and Industry Operations Investigators visit licensees throughout the Tampa Field Division to discuss voluntary security. Anyone with information about the stolen weapons or the people in the surveillance video is asked to call Det. Gauthier at (352) 427-3242 or anonymous tipsters can call Crime Stoppers at (352) 368-7867.